Ben has overcome some obstacles in his life; most significantly, in sixth grade, he was diagnosed with autism. Ben struggled to recognize emotions and he says he could never tell how someone was feeling when he looked at them. Because of this, his educational path like many Generation students, was sometimes elusive. After high school, he attended college to become an engineer, but after only two semesters, he recognized it wasn’t the right fit. He then returned home to Pennsylvania and started the nursing program at a community college. 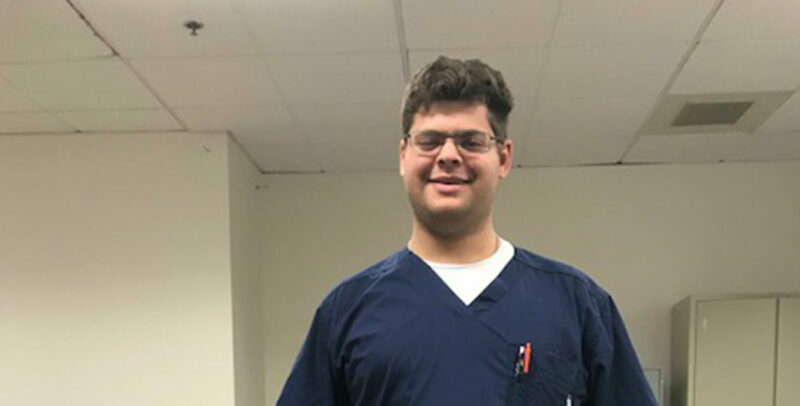 After completing only two semesters and frustrated with his progress, he discovered Generation’s Certified Nursing Assistant program and decided it was a better fit. He, like many Generation students, found stability and support in the program. He relied on his mentors and instructors to help with assignments and questions and says that they were always there to talk through any problems or issues. Ben says that with help from Generation’s tailored curriculum and quality instructors and mentors, he’s started to overcome his challenges to read faces and emotions. In fact, Ben’s current supervisors at Cadia Health say his bedside manner is top-notch. This close connection and one-on-one attention from Generation’s staff helps get students like Ben to the finish line and land their dream job.